As the smart home revolution rolls on, it’s now cheaper than ever to automate the mundane daily tasks like vacuuming. The iLife X5 is perhaps the cheapest robotic vacuum yet at just $125, and can even mop your floors too. Read on to find out what we thought of the X5. 2kg weight x 30cm diameter x 7.7cm height. Regular mode: 550pA; Max mode 700pA suction power. Standard array of sensors and drop detection. 300ml dust box, can be exchanged for 300ml water tank. 2600mAh battery; around 90min operating time. Includes a virtual barrier emitter (you can also buy additional barriers if you need more), charging station and remote control. Nearly all parts user-serviceable with replacement parts available online. Like most robot vacuums, the X5 can be programmed to operate on a single timed schedule, which is the most powerful feature they offer. All you need to do is remember to empty the dust box — everything else with then be autonomous, as the X5 scuttles around your home every day at a set time, picking up small bits of dirt. There’s still no affordable robot that can clean stairs, but at least it won’t fall down them either. 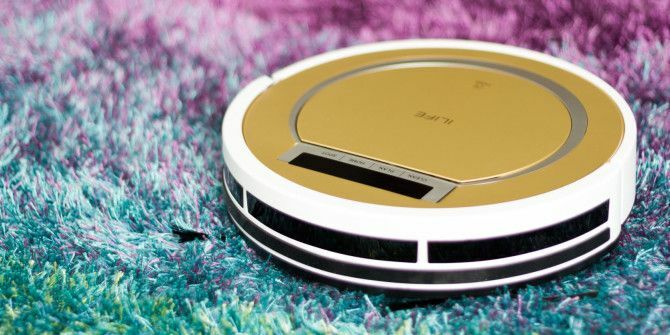 We’ve previously reviewed the iLife A4 iLife A4 Robot Vacuum Review iLife A4 Robot Vacuum Review Previously the domain of the super rich, you can now pick up a robot vacuum cleaner for under $200, and as far as household gadgets go, this is surprisingly one of the more useful ones. Read More , and I was thoroughly impressed with both the cost and feature set. Since the A4 model is still being sold at a small price difference, it’s worth looking at a quick summary of what else differs between the two models. Price — At the time of writing, the X5 is $120 while the A4 is $135. Sleeker design — As well as being slightly smaller, the X5 features a slimline bumper as well as top-loading dust box (the A4 pulled out from the rear). The X5 generally just looks better, compared to the almost tank-like aesthetics of the A4. Less suction — Both models have a standard suction power and MAX option, but the A4 has a range of 700-1000pA while the X5 is limited to 550-850pA. In normal use, maximum power is not actually enabled — it must be turned on manually from the remote. Slower — I haven’t empirically tested this, but the X5 feels slower than the A4 was. If the motor driving the motion is the same as the motor providing the suction, this makes sense. Smaller dust box — 450ml in the A4 vs. 300ml in the X5. Mopping function — The X5 includes a wet mopping feature, outlined below. Virtual barrier — The X5 model allows a little more flexibility when restricting the robot’s work area by including a virtual wall device. This uses an infra-led LED to fool the sensors into thinking the robot has hit a wall. Useful if you don’t want to close doors to keep the robot inside a single room. One of the biggest differentiators between this and the previous model is a swappable cartridge system, which holds either the dust box, or a new water reservoir. When the water reservoir is inserted, water slowly drips on the mopping pad underneath. In testing, results were a little disappointing. Water certainly does fall onto the mop, and it does get the floor wet, but even the mildest of muddy paw prints were left uncleaned during our initial test. There’s no steam cleaning, so it’s literally just like dragging a wet cloth across the floor. Done by hand, you’d be exerting some downward pressure to scrub off stains, but the weight of the device, or the amount of contact between the wiping pad and the floor, just doesn’t seem sufficient to make it worthwhile. It works okay on small spillages like a bit of orange juice, but that’s just not the kind of task you’d be using an automated cleaner for. In addition — while recording some on-camera mopping tests — our second attempt at cleaning up some freshly spilled ketchup resulted in the robot jamming up, though I’m still not sure why. Nothing was broken — removing the mop and switching back to regular vacuuming worked fine, but suffice to say I’m really not convinced by the mopping feature at all. It feels like unnecessary feature creep. The real power of a robot vacuum is in its ability to autonomously clean with little user intervention, so the idea of attaching a mopping pad and filling up a water tank just doesn’t gel with that. The X5 includes a virtual barrier device, a small battery-powered black box that emits an infra-red signal to fool the vacuum into thinking it’s found a wall. The emitter sits on the edge and transmits forward, with one side designated as the n0-go area. In testing, we found it worked reasonably well, but we had to adjust the placement a few times as the barrier seemed to be reflecting or “leaking”, such that X5 would get disoriented and stuck in a circle. Suffice to say, this isn’t a feature we found useful, but it’s possible we just haven’t thought of the right use case. The most obvious use case is of course to prevent it from leaving a particular room, without having to close the door. However, I have to ask myself: is closing the door really that hard? Is it hard enough that I’m going to open the door, pull out the virtual barrier, and turn it on, and place it in right place? Perhaps those of you with huge open plan housing are going to appreciate this feature more than we did. Should You Buy the iLife X5? Though aesthetically I prefer the sleek design of the X5 to the A4, the larger A4 offers both higher suction and a larger dust box, giving you more time before it requires emptying. Practically speaking, I don’t feel like the addition of a wet mopping function or virtual wall offers a significant benefit to justify that sacrifice, but that’s going to be a question of personal taste. For general, everyday vacuuming tasks the X5 is fine. Not great, but not bad either. It’s not that the X5 is flawed in any particular way — but I’m going to recommend you pay the $15 difference and buy the iLife A4 model instead (use the coupon code “ChuwiA4” to get it for $127!). I am however still astonished that both of these models now cost around $130 — even less than when we first reviewed the iLife A4 iLife A4 Robot Vacuum Review iLife A4 Robot Vacuum Review Previously the domain of the super rich, you can now pick up a robot vacuum cleaner for under $200, and as far as household gadgets go, this is surprisingly one of the more useful ones. Read More . I thought the A4 was incredibly good value for money then, and that obviously hasn’t changed. You can view all of the GearBest’s Robot Vacuum range here. I had viewed this robotic vacuum yesterday and compared it between 2 online shopping website but can't afford it. Fortunately,15 minutes before the contest ended, I found this link, I wish I could have this vacuum. If I won,I'm the happiest housewife in 2016..
Would love to win one of these! Looks like a fantastic product and I have got to congratulate you on the amazing review if I don't win one now I may have to go and buy oneself one anyway! I have wanted a robot since I was 2 years old (clean my room.) Im excited to say each new gadget is one step closer to the only real wish Ive had and stuck with since I declared my need for a robot at 2. Aw man, I would love to have one of these. It's impossible to keep the house clean when you have classes to attend to all day, and sleep to attend to all night. There is no door between my kitchen and living room. I have a very old roomba and virtual barrier. If I don't set the barrier my roomba ends up in the living room stuck on something. I just use it for the kitchen and the virtual barrier is great to have.